DestroY F1 Tweaker is a great tool for EA Sports' F1 Challenge '99-'02. With DestroY F1 Tweaker you can configure lots of options not included in the stock game, it allows to change and restore HDV and engine.ini car performance files for all seasons including RH2004, RH2003 and CTDP2003. It also features a quick file installer to install several game files and gives you advanced 3D configuration features. - Ability to exchange and restore HDV and Engine.ini files from Ralph Hummerich's 2004 Season (RH2004)!! - New file type in the "Quick file installer": "2004RH GDB file". - Ability to exchange and restore HDV and Engine.ini files for CTDP's 2003 season! - 10 new extra game options! - New "log" feature, DestroY F1 Tweaker automatically logs all your options/files changes with time and date included (log.txt)!! - New file types in the "Quick file installer": "CTDP2003 GDB file" and "Terrain.ini file". - In numerical fields, DestroY F1 Tweaker will check that a value is inserted and that no "alpha" (A~Z) characters are used. - DestroY F1 Tweaker will check if all neccesary program files are available on startup. - Improved "F1C folder load" check, searches for F1C exe to be sure you chose the correct folder. - Big ammount of internal improvements. - Bugfix: Quick file installer didn't install "Damage.ini files" correctly in previous versions. - Bugfix: "FullScreen AntiAlising" option wasn't saved in the correct place. - Bugfix: "Multiplayer - Qualify sessions" option now works properly. - Bugfix: "Multiplayer - Reconnaissance laps" option now loads its state in the correct place. - DestroY F1 Tweaker will now load the default value of ALL game options on category startup. - Bugfix: Minimizing to tray now restores correctly. 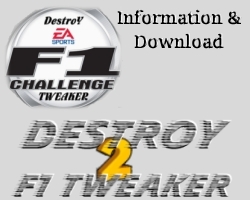 - DestroY F1 Tweaker is now renamed (previously known as DestroY F1 2002 Tweaker) and is prepared to work with EA Sport's new simulation F1 Challenge '99-'02 (Files manipulation, several game options and the "Run F1C 99-02" feature will NOT work if used with F1 2002 or a previous EA F1 simulation). -DestroY F1 Tweaker was completely re-programmed and features a completely new user friendly interface. - 36 extra game options!! 18 new extra options, with 2 new option categories! - Ability to exchange and restore HDV and Engine.ini files for all seasons including RH03. - Completely new "Quick file installer" to install several game files easily without messing with the game folders and files. - Completely new "3D Configuration" section allows to configure advanced 3D options, and shows complete system information to help configuration. - Ability to backup the PLR file, saving it in any place of your preference. - New Status Bar shows you the updated options and shows you the result of file changes and installations. - Minimize to tray or to taskbar option. - DestroY F1 Tweaker does not need to be installed in the game folder for "Run F1C 99-02" feature to work anymore. - New "Info" button in hard to understand options. - New intro screen, new separate configuration screen, new welcome screen with file checkings, new about screen, new icon. - Internal: DestroY F1 Tweaker now stores the information in an INI file instead of the registry. - Bugfix: Reloading the PLR file to have the status of some options updated is no longer neccesary. - Bugfix: No options will reset when reloading the PLR file. - Ability to exchange HDV's with Safety/Medical Cars and Driving School Arrows and Minardi. - Ability to run F1 2002 or Ralph Hummerich 2002 through DestroY F1 2002 Tweaker. - Ability to put on or off the program intro splash screen. - DestroY F1 2002 Tweaker will now set the F1 2002 folder where you pick the file from as default directory. - The intro screen will now be centered when program starts. - Bojan "Bokzy" Oljaca for the dll. This software is freeware and you can feel free to distiribiute it and use it without any charges. You are not allowed to develope the software back, change, spilt, decompile, disassemble or translate the software product neither in parts nor as whole thing. DestroY F1 Tweaker is in no way affiliated with EA Sports or Image Space Incorporated. EA, EA Sports and Image Space Incorporated are trademarks of their respective owners. DestroY F1 Tweaker is in no way affiliated with Ralph Hummerich (RH), EmacF1 or Carshape & Texture Design Project (CTDP), and doesn't use any of their work. Send me your comments about the program and report any bugs you find. E-mail me if you have any doubts.